The BODYHARMONICS school offers the most comprehensive training course in Thai massage currently on offer in Britain. Maria Mercati has been teaching successful courses since 1995. The Thai Massage course qualifies & insures you to earn a living as a Thai massage practitioner. It’s unique, highly intensive teaching approach covers not only Thai massage for wellbeing but also as treatment for musculo-skeletal problems. There are now many Thai massage schools in this country, most of which teach a routine as we do. This will enable you to use it for a tailor-made, 20-minute treatment or a 2 hour whole body well-being massage depending on the client’s needs. However, in addition, this course will explain the how, the why, the when and the how much of each technique and which acupoints to be used for specifically treating different conditions. Peter Packard together with Maria Mercati will teach the location and function of 20 main acu points which makes the Thai massage more therapy oriented. Maria is the first ever teacher to introduce acu-therapy into Thai Massage. Even in Thailand many masseurs are copying this from Maria’s Tui Na book so as to make their techniques more therapeutic! Being able to accurately locate these acupoints, and feeling and locating pathological changes in the underlying tissues is essential for the therapeutic use of Thai massage in treating musculo-skeletal conditions and sports injuries. Maria Mercati & Peter Packard doing Thai Massage course at Bodyharmonicsa School. The course teaches all the pressing & manipulations techniques and their variations which have been practised for over one thousand years, many of which are based on yogic principles. Thai massage therapy is a wonderfully flowing sequence of gentle, controlled stretches interspersed with pressure applied to various parts of the clothed body. It teaches the subtle and complex interactions between the giver and receiver which are so important in Thai massage therapy. Over 150 techniques are taught and incorporated into a flowing, whole body, massage therapy routine. Many of these are not shown in her book and dvd’s. All advanced joint manipulation techniques are taught safely under supervision to prevent injury to either the giver or receiver. Their use in treating musculo-skeletal problems & sports injuries is explained. Great stress is placed on the use of body weight and correct positioning of the practitioner’s body. These include spinal manipulations, shoulder and hip manipulations and massaging using feet and bodyweight. 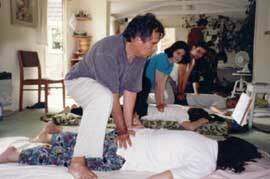 Peter Packard teaching Thai Massage course at Bodyharmonics School. Peter Packard and Maria will also teach you to give a Thai foot massage, a Thai neck & shoulder on-site massage and a lower back treatment – which will prove to be valuable within an income generating context. Our diploma is recognized by Acupuncture-Acutherapy Council as well as by Embody which is affliated to CThA the Complementary Therapists Association. 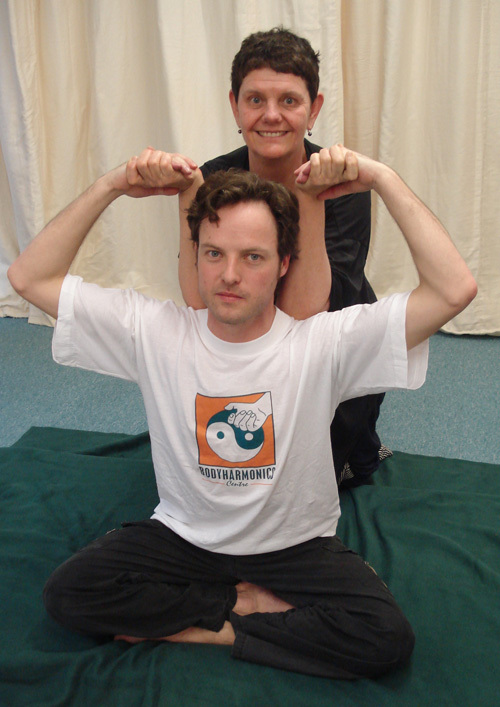 Maria Mercati was elected Chair of The Thai Yoga Massage Association (2006) who helped set the basic standards. Membership of Acupuncture-Acutherapy Council is the leading organisation for you and your Thai massage.